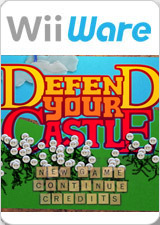 The Wii version of Defend Your Castle boasts a new graphic style, prominently featuring elements taking the form of household objects, such as bottle caps, bread ties and wooden ice cream sticks for sprites, with backgrounds made out of construction paper with clouds of tissue paper. Because of rating reasons, the Wii version does not contain the use of blood; the stickmen attackers just collapse instead of splatter, although their heads remain on screen before fading, something which did not happen in the original version. The graph below charts the compatibility with Defend Your Castle since Dolphin's 2.0 release, listing revisions only where a compatibility change occurred. This page was last edited on 10 January 2018, at 17:38.